A trip to the movies nearly derailed Dr. Penico’s career. The film’s volume was unbearable, and two weeks later, the tinnitus set in, leaving Dr. Penico with a career-altering decision. It was either use the Sanctuary™ or think about quitting his job. For more than 30 years, Patricia Harrington, Au.D., has been treating many types of hearing problems at her practice in Largo, FL (www.calmthenoise.com). 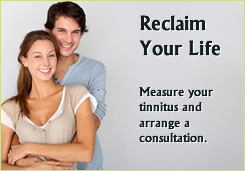 Her interest and treatment of tinnitus started in 2009 after seeing more and more reports of tinnitus across the country.